Everyone has had a very busy week in the lead-up to Christmas, so now is a good time to catch up on all the important stuff you might have missed! While there has been some very big news this week - Gatwick! Theresa May! A third example! - there have been some smaller (but no less interesting!) stories since Monday that might have passed you by because this week was so darned busy! Here are the five biggest stories of the week you might have missed, simply click on the headline to head to the story in full! 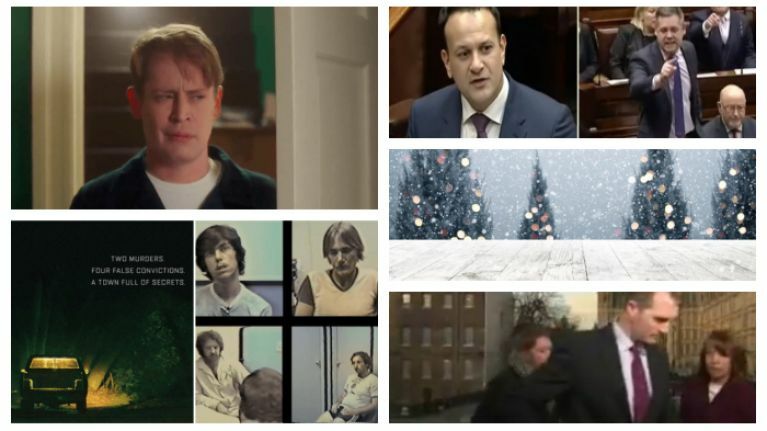 Met Éireann revealed the most extreme weather that Ireland has ever experience on Christmas Eve and Christmas Day down through the years (check that out in full here), but it looks like we shouldn't expect anything similar to that this year. Varadkar’s comments came following a heated discussion about recent events in Roscommon, when a number of people were injured and a dog had to be put down following an incident at a house that had been the subject of an eviction order in Strokestown. Two MPs, one on either side of the Brexit debate, took part in a debate live on Sky News on Monday, which ended with the host of the debate practically asking one of them to leave. In a story that gained national attention with John Grisham’s best-selling book, The Innocent Man: Murder and Injustice in a Small Town, the six-part documentary series focuses on two murders that shook the small town of Ada, Oklahoma, in the 1980s - and the controversial chain of events that followed. The actor reprised his most famous role for a Google advert and even though he's all grown up, it's still surreal to see Macaulay Culkin as Kevin. QUIZ: How well do you know the Marvel movies?